With an output of only 3-5 handmade editions annually Tony has not been very prolific despite a career spanning 30 years so far. We get lots of enquiries about whether particular Tony Ogle prints that no longer appear in Tony's collection at Prints.co.nz are still available. Usually these are the result of people ogling (hee hee) a print they have seen that they would like to buy for themselves. Unfortunately the answer is always no, because once an edition has sold out Tony never does another edition of the same print. Below is a summary for collectors by year of Tony's sold out editions from the last decade - it is safe to assume all prints dated before 2000 are sold out. 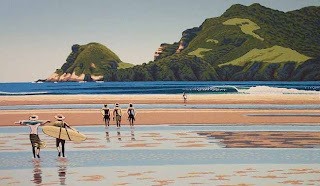 All prints currently available from this talented NZ printmaker (including his latest releases in 2011) are listed in the Tony Ogle collection at NZ's specialist art print store. The next edition to sell out will almost definitely be "Okiwi Crossing" (shown here), we have only two A/Ps (the rare artist proofs) left in stock today. The following prints by Tony Ogle have sold out since this post was written: Midday Matapouri, Okiwi Crossing, Waxing Up and Rising Swell.